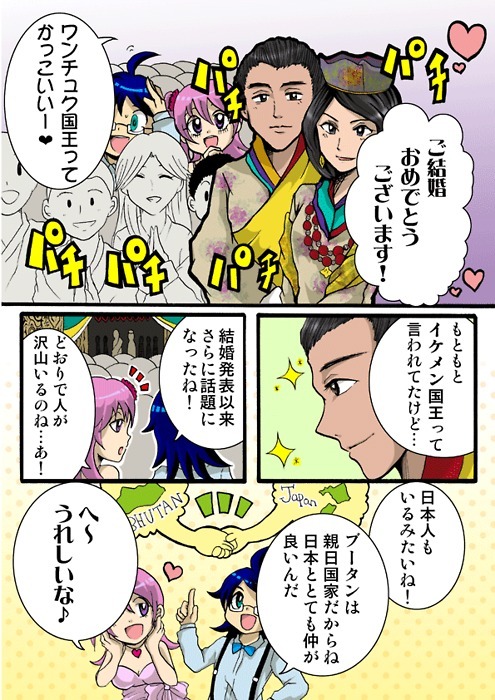 This Japanese comic (magna) about the King and Queen of Bhutan popped up when I was browsing on Tumblr. Posted here, the original source info is missing but it must date to last November when the very highly regarded royal couple visited Japan, causing "BHUTAN MANIA". "King Wangchuk is soooo cool!" ...ever since the wedding announcement, he has become even more a topic of conversation." "It makes sense that there are so many people here!" "Looks like there are Japanese people here, too!" "As Bhutan is a pro-Japan nation [親日国家], its relationship with Japan is very good."